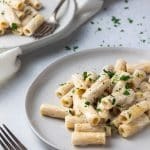 This flavor packed, incredibly creamy, comforting bowl of pasta is not only easy to make, it’s also completely vegan! Place cashews in a bowl and cover with water. Let soak for at least 2 hours, and up to overnight. Preheat oven to 400° F. Slice about 1/2 inch from the top of each head of garlic, to expose the cloves. Place the garlic, cut side up, on a few sheets of aluminum foil. Drizzle with the olive oil and sprinkle with a little salt and pepper. Gather up the sides of the foil to make a packet, and crimp it tight on all sides. Place the packet in the oven and roast for 30 minutes. Remove from oven and let sit until cool enough to handle. Cook rigatoni in boiling, heavily salted water until just al dente. This dish doesn’t really do a lot of cooking “in the sauce” so make sure your pasta is just about there when you pull it. While the pasta cooks, drain the cashews and rinse under cold water. Transfer cashews to a blender or food processor. Take each head of garlic and cut side down, squeeze them over the blender jar. The cloves of garlic will pop out, and you’ll be left with the papery skins. Add one teaspoon of kosher salt, 1/2 teaspoon of black pepper, the lemon juice, and 3/4 cup of water. Blend until completely smooth. Set aside. When the pasta is done, reserve 1/2 C of the cooking liquid in a cup before draining. Add the pasta back to the pot, stir in the cashew sauce, and place over medium-low heat. Stir to coat all the noodles, adding a little bit of the reserved pasta cooking water to thin the sauce out as needed. Soak your cashews (and leave them in the fridge) the night before to make this an easy, weeknight dish. You can also roast your garlic ahead. Cook according to the recipe and squeeze the cloves out into an airtight container. Then pour enough olive oil in to cover the cloves and refrigerate for up to one week. This will continue to thicken up as it sits, hence the reserved pasta water.